The machine is limited in length to ~4 inches. The border of your patch will fray if it is not stitched, so you can either stitch a border (which is best done in your initial design) or you can hem the ends like I did with my patch. My studio loves the patches. 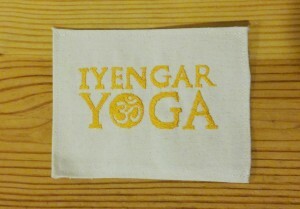 I hope to make a few more to give out to other Iyengar yoga enthusiasts and friends. Those black panels are solar panels and it has a USB charger inside so you can charge your phone! This would be a GREAT travel bag! That’s so cool that you can iron your patch to something else after you’ve created it. I’m really excited to try my hand at creating my garment with my own logo on it. Hopefully in the future, we can also gain enough knowledge to create a garment with a practical application as well. This was awesome to read about. 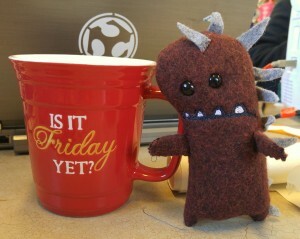 I didn’t get to spend any time at the embroidery workshop so this gave me a lot of insight! I would’ve never known that lettering was tricky when it came to thickness. Did adjusting it after being printed take a long time? 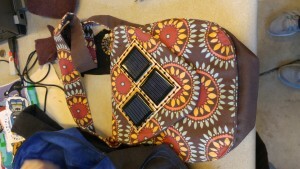 Plus, I agree the solar powered bag would make a great travel tool! Especially to charge your phone while you’re out and about exploring. Awesome post! I saw Jessica’s bag as well, isn’t that crazy, I would love a bag like that. Maybe something that can charge my laptop as well, haha.